Sean Roberts and Thomas Letchworth of Ashland went to a cannabis business conference in Portland last week to sell their new brand of hemp cigarettes. 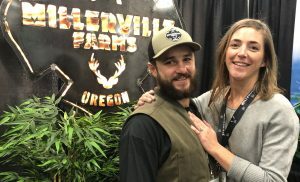 Ted Jared and Hannah Watters, owners of Corner Creek Farms in White City, went to the conference to sell their cannabis farm. 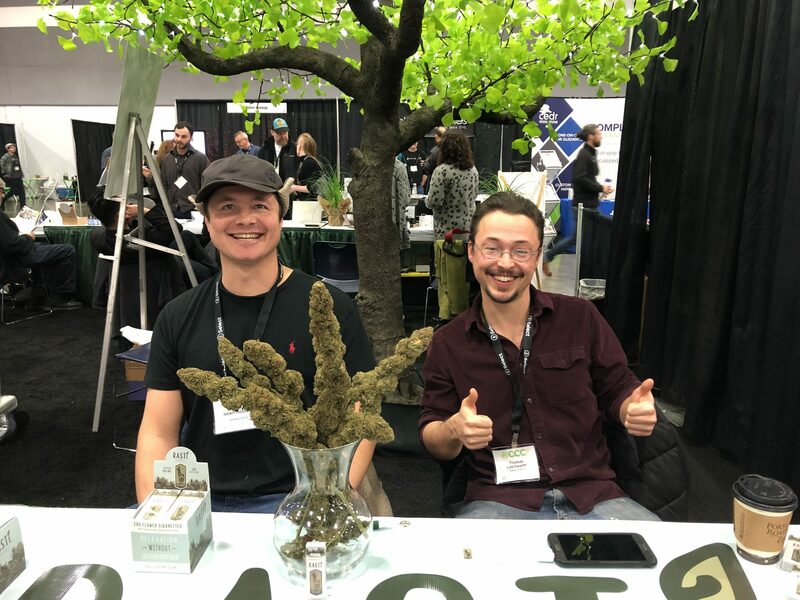 The fifth annual Cannabis Collaborative Conference, held Jan. 23 and 24 at the Portland Expo, brought together buyers, sellers, growers, product manufacturers and a host of professionals who service the cannabis industry, including lawyers, government regulators and marketing specialists. 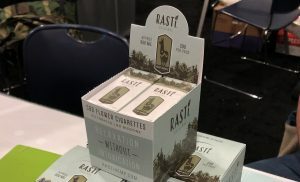 Roberts and Letchworth had a bouquet of giant hemp buds at their table in the Portland Expo as they introduced their product to the world — a brand of nicotine-free, CBD cigarettes called Rasti Hemp Smokes. “There’s a lot of interest,” Letchworth said of their CBD cigs, which are available at Puff’s Smoke Shop in Ashland, on their website (https://rastihemp.com), and through various retailers in California. Nicotine-free, the hemp-derived CBD cigarettes are described as an alternative to tobacco and marijuana. The cigarettes, which contain less than 0.03 percent THC, also include a pinch of organically grown herbs — red raspberry leaf, damiana and mullein — and are packed into 100-percent biodegradable, organic and unbleached filtered tubes, according to their website. Each cigarette has 90 mg of CBD, and a pack of 10 costs $44.95. Letchworth and Roberts own Galaxy Farms in Ashland, along with Roberts’ wife, April, the farm’s head gardener and the person who designed the artwork on the packaging. They previously raised cattle and organic vegetables, and then three years ago they made the switch to hemp. Rastis are the second hemp cigarette to be launched by Southern Oregon entrepreneurs in recent months. Duane Dennis and Evan Marshall launched Plain Jane hemp cigarettes in 2018 (see tryplainjane.com for more information). In addition to showcasing new products such as Rastis, the CCC included discussions and forums, such as sessions on women and equity in the industry, information about human-resources practices and how to build your business across borders. In the exhibit hall, cannabis businesses from around the state set up and engaged with potential customers and partners. The event was focused on business-to-business interactions, with the hope of making deals, learning about new trends and topics, and building relationships. Mary Lou Burton, the event’s founder, said last year about 2,500 people attended the event. Burton was on hand near the investor lounge with her business partner, Michelle Grogan. The two help people in the cannabis industry make connections through their company Cannabis Connex. The lounge area was sponsored by Cultiva Law, cannabis producer Oregon Valley Greens, and White Buffalo, an Oklahoma-based hemp company looking to partner with local farmers who want to participate in industrial hemp as a rotational crop. Ted Jared and Hannah Watters, owners of Corner Creek Farms in White City, were at the conference seeking prospective buyers for their farm. 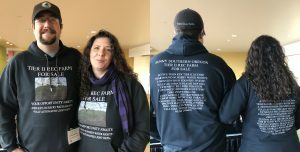 The couple walked into the conference with matching sweatshirts that doubled as a real estate listing. Jared Watters said he has had a medical farm since 2010 but started down the recreational path in 2015. Since then, he says, the journey has been slow, with a lot of hurdles dealing with the county and state. Ted Jared and Hannah Watters, owners of Corner Creek Farms in White City, were at the CCC conference seeking prospective buyers for their farm. The couple wore matching sweatshirts that doubled as a real estate listing. “We can’t have our kids on an OLCC farm, but we can have our kids on a hemp farm,” he said. The couple are selling the whole property — 4.26 EFU acres, which includes a house and recreational farm with an active Tier II license. The property is listed with Luke Scott Real Estate. Rhea Miller and her husband, Matt, of Millerville Farms in Takilma. The farm has a mission to “cultivate craft cannabis in clean and natural living soil, adding only organic nutrients,” according to its website. Their strains include the “high THC stunner” CookieMeister, The Original Jager, described as “relaxing and ultra-pungent,” and the “creative, focused goodness” of Tahoe Dream, to name a few of the strains on their menu. “We are trying to get our brand and flower exposed to new customers and opportunities that are up here in the northern side of the state,” Matt Miller said, adding that last year’s harvest brought in approximately 1,800 pounds of flower. As for 2019, Rhea Miller said they will keep building on what they have already accomplished. Ted Bernhard, a lawyer at Cultiva Law, a firm focused on the cannabis industry, with offices in Portland and Seattle, provided free consultations at the conference. “The goal is to answer any questions and to help validate or debunk potential investment opportunities by tapping into our network and experience,” said Bernhard. “He said the top three issues people grapple with are how to structure their business, how to approach and interact with investors, and how to structure the investment documents in a way preferred by investors. He also regularly fields questions regarding licensing and regulatory issues. In a session called, “How to Grab Shelf Space and Create Lasting Partnerships,” panelists experienced with the dispensary intake process shared tips and strategies on how to make your product stand out. First tip: If you are trying to get your product sold by a dispensary, be professional and kind throughout the entire process, and practice patience. Dispensary staff are busy and will get to you eventually. “Understand while we are trying to answer all your emails, we are also trying to meet compliance,” said Maddie Love, director of inventory at High Quality, a dispensary in Corvallis. She advised product makers to be sure they have a good brand and are authentic. Fellow panelist Mary Thomas of The Dub Wholesale & Experience said she wants to know the back story of your product and what makes you different. And if you are opting to hire a distributor, make sure you do your due diligence, she said. Beau Whitney, senior economist at New Frontier Data, gave a presentation at the conference called “International Growth of Hemp and CBD Markets.” Whitney, who spent some of his early childhood in Medford, gave an overview of the Farm Bill and what to anticipate moving forward. Hemp farming is growing in Oregon. In 2016, 500 acres of hemp were planted, and in 2017 that number jumped to 3,469 acres. In 2018, 7,808 acres of hemp were grown in the state. He said 50 countries have some form of legalized hemp policies, with Canada, China and the European Union positioned as the leaders in terms of exports and production.